It's OK to Be Afraid of the Dark. I Corinthians 12: 12-14, 27-31. The Memorial of Saint Cornelius, Pope & Martyr, and Saint Cyprian, Bishop & Martyr. The Twenty-Fourth Tuesday of Ordinary Time. 11:50 PM 9/16/2014 — Certainly the most impressive miracles and signs performed by our Lord in the Gospels are those in which he raises someone from the dead: the Synagogue leader’s daughter, the centurion’s manservant, his own relative, Lazarus, and this unknown person of whom we read today, a young man being carried to his grave, accompanied by his grieving mother. 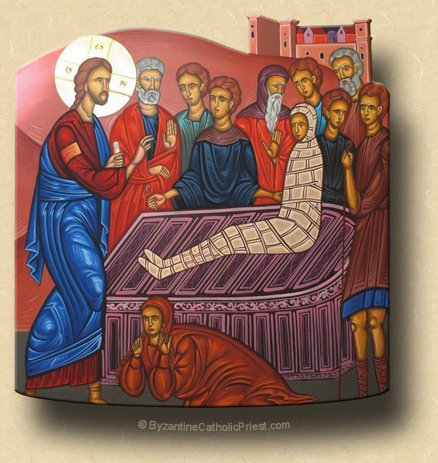 The passage from Luke's Gospel has a particular significance for me since, in the Byzantine Rite in which I served for nearly twenty years, the priest chants this Gospel lesson at the doors to the church at the conclusion of every funeral. It’s a sad scene St. Luke paints for us, which has a happy ending when Christ miraculously restores life to the dead man. It’s a testimony to our Lord’s divinity—for who can raise the dead except God?—as well as his power over death, which he would proclaim most perfectly in his own resurrection. But the Scriptures speak a metaphorical language that is often foreign to modern ears. For this is more than just a story about Christ’s divinity and his power over death; it is a lesson about sin. All references to death in the Holy Gospel are references to sin. For the Evangelists, sin and death are the same thing: where one is mentioned, the other is understood. You may remember, those of you who were here on Sunday, that we touched on this. Just as physical death envelops the body in darkness, so sin envelops the soul in darkness; which is why St. John describes Christ as “…the light [that] shines in the darkness” (John 1:5). Darkness is the quintessential evil for St. John: sin, error, heresy, disobedience, licentiousness, covetousness, death itself, are all part of the world of darkness in the Holy Gospels. And Christ is that light which shines forth in the darkness and makes it disappear. “Walk as a child of the light,” says our Lord again and again, meaning, “Walk apart from sin.” Because the person who walks in the way of sin must walk in darkness; he prefers the darkness. It is the darkness that hides his sinful deeds from the eyes of others. Sinful deeds are committed in darkness because they must be secret. When Christ admonishes us to walk as children of the light, he is saying, “Have no need for secrets.” Everything we do, no matter how private, should be able to be seen without scandal. Certainly everyone is entitled to privacy; and all of us have private parts of our lives, our jobs, our marriages, which are not intended for public view. Most of the time it’s a question of appropriateness or modesty. But when a person develops a part of his or her life that must be kept secret because it contradicts the life he or she lives in public—because it would cause a scandal for those who know him—such a person must ask himself if it should be at all. Now, everybody sins. St. John says in his First Epistle that anyone who says he is not a sinner is a liar. I sin, you sin, we all commit sins. But, the great Father of the Church, St. John Chrysostom, explains to us that, even though we all sin, it is possible to distinguish what he calls the “evil sinner” from the “good sinner”, as odd as that may sound. The “good sinner”, he says, when he is told he has sinned, reacts with sorrow and begs forgiveness. The “evil sinner”, when his sin is discovered, reacts with indignation, protesting that his privacy has been violated. And over the centuries, no excuse has been used more to defend sinful actions when they are brought to light then the so called right to privacy.